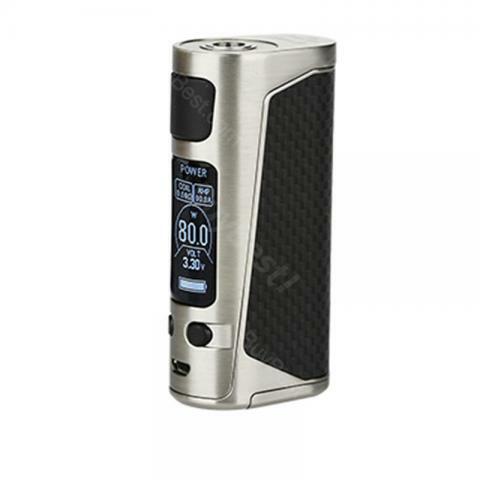 The Joyetech eVic Primo Mini mod has a 1.3-inch OLED screen and new easy-to-go interface, 80W output, powered by single 18650 battery (not included). The Joyetech eVic Primo Mini mod has a large 1.3-inch OLED display, its interface is clear and simple and easy to operate, and the eVic Primo Mini is a compact unit that can use a variety of attractive colors. Compared with other versions, the power and functionality are stronger and it support firmware upgrade. The eVic Primo Mini has a maximum output of 80w and has a range of unique features, including quick charging, clock, custom logo and temper control.510 thread design enables it to applicable to various tanks which have different pins from 4.0 to 5.5mm. There are 5 colors to choose. eVic Primo Mini 80W is elaborately created, the quality is top, the same quality with the one I see in the local vape shop. The price is cheaper. Дизайн Joyetech eVic Primo мне понравился и цена ниже чем у других магазинов! Highly recommend this joyetech evic primo mini to all vapers. Vape is good and you can put your custom logo. Better subscribe to buybest's email notice so that you will know what they have for flash sale in advance. Trust me, their sale price is the killer. Works great! I love the big fire button and screen. The flip open battery cover makes battery replacement much easier and convenient. Can match with many of my favorite tanks. Would order a red evic primo mini for my girlfriend as she tried mine and loves it. This Joytech mod looks quite attractive. The quality is also good! I am quite satisfied. I love my evic primo mini mod. Everything is perfect for me. And good flash sale price, buybest. I am happy with this order. Great little mod, it arrived within 20 days. It is smaller than you think at first, which makes it more cute and comfortable too. I'm greatly satisfied. Purchased this Joyetech eVic Primo Mini TC MOD for my husband as a gift! He really like it, and I support he use e-cig! Tolle Handhabung. Zigaretten werden echt gut gestopft und Joyetech eVic Primo Mini geht rucki zucki.